Vladimir Putin prepares to pay a visit to Iran to make a deal with Hassan Rouhani. Kommersant has learned that Russian President Vladimir Putin is scheduled to visit Iran on Aug. 12. According to sources involved in preparations for the visit, the Kremlin is hoping to use Iran’s election of a new president, Hassan Rouhani, to revive negotiations on the country’s nuclear program. President Putin last visited Tehran in October 2007 to take part in the Caspian Summit, on the fringes of which he met with Iran’s former President Mahmoud Ahmadinejad and Iran’s supreme leader Ayatollah Khamenei. The 2007 visit galvanized Russian-Iranian relations, which deteriorated once again during the presidency of Dmitry Medvedev, who terminated a contract for supplies of the S-300 anti-aircraft missile systems to Iran. It seems that Moscow is counting on Rouhani, who is believed to be a reformer, to demonstrate more flexibility than his predecessor did in discussing his country’s nuclear program. At the same time, according to the source, the situation is complicated by the fact that Iran’s president has limited powers: It is Ayatollah Khamenei who calls the shots. To nudge him to a compromise, the West will have to guarantee a lifting of sanctions. Two years ago, Moscow presented a proposal to settle the Iranian nuclear problem via step-by-stem mutual concessions (the so-called Lavrov Plan). That initiative has yet to be implemented, but the Russian president’s visit could breathe new life into it. Vladimir Putin is also expected to discuss bilateral relations in Tehran — above all, cooperation in the nuclear power and military-technical areas. 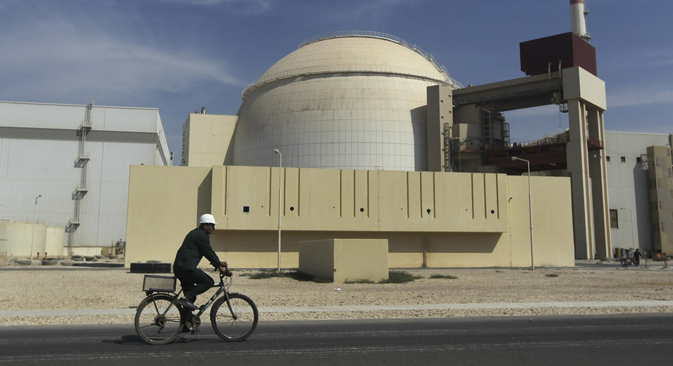 During his visit to Moscow in early July, the outgoing Iranian President Mahmoud Ahmadinejad referred to Russia’s construction of new power units at the Bushehr Nuclear Power Plant as essentially a done deal. However, Kommersant sources insist that Moscow has yet to make a political decision on this matter. Rosatom has stated that the state-owned corporation’s relations with Iran are limited to the completed first unit, and no negotiations on any other projects are under way. Kommersant’s sources in the nuclear power industry explained that Rosatom is not really interested in continuing its work in Iran, now that it is bidding for contracts in the Czech Republic and Finland. In the military-technical area, Moscow has already met Tehran’s demands by offering it the superior Antey-2500 systems instead of the S-300. The Russian government is hoping that the out-of-court compromise will help convince Iran to revoke a $4-billion lawsuit it filed against Rosoboronexport for breaching the S-300 supply contract. Tehran has not yet responded. A source close to Russia’s military-technical cooperation system said that Vladimir Putin would, “without fail,” mention this subject during his visit.